Bundesliga | Matchday 34 - Live Updates! Matchday 34 - Live Updates! Munich - The final weekend of the 2013/14 campaign produced yet another festival of nail-biting football, with plenty of issues decided at both ends of the table. Bundesliga champions FC Bayern München celebrated lifting the Bundesliga shield for a record 23rd time with a last-gasp 1-0 home win against VfB Stuttgart, who announced that Armin Veh will replace Huub Stevens as head coach in the summer. Robert Lewandowski finished top of the scoring chart after helping Borussia Dortmund to a 4-0 victory away to Hertha Berlin in his last Bundesliga game for BVB. 1. FC Nürnberg were condemned to their eighth relegation to Bundesliga 2 after falling to a comprehensive 4-1 defeat at FC Schalke 04. Bayer 04 Leverkusen booked their place in the UEFA Champions League play-offs thanks to a 2-1 win against SV Werder Bremen on Matchday 34. 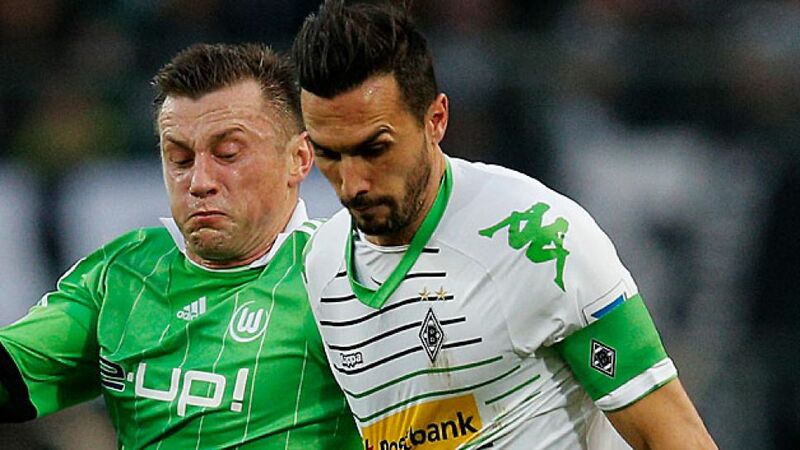 VfL Wolfsburg missed out on UEFA Champions League qualification despite a 3-1 victory over Borussia Mönchengladbach, who will join the Wolves in the UEFA Europa League next season. Hamburger SV reached the relegation play-offs despite a 3-2 defeat against 1. FSV Mainz 05, who will enter the Europa League at the qualifying stage. 1899 Hoffenheim ended Eintracht Braunschweig’s slim hopes of reaching the relegation play-offs after a 3-1 home win. FC Augsburg missed out on a place in the Europa League, in spite of a 2-1 victory over Eintracht Frankfurt. Hannover 96 celebrated a topsy-turvy 3-2 win over SC Freiburg at the HDI-Arena. SC Paderborn 07 sealed Bundesliga promotion following a 2-1 victory over VfR Aalen on Sunday, while third-placed Greuther Fürth will be going head-to-head with Hamburger SV in the play-offs. DSC Arminia Bielefeld recorded a 3-2 victory away to SG Dynamo Dresden in Bundesliga 2, leapfrogging their hosts in the standings to secure the relegation play-off place while simultaneously condemning Dresden to the third tier. That puts an end to our live coverage from Matchday 34. Don’t forget this season is anything but over though, with Hamburger SV hoping to avoid the drop when they face Bundesliga 2 side Greuther Fürth in the play-offs this Thursday and Sunday, while Arminia Bielefeld aim to get the better of third-tier SV Darmstadt 98 on Friday and Monday. And, not to forget, there’s yet another domestic highlight on the agenda this Saturday when the league’s two top sides FC Bayern München and Borussia Dortmund will be going head-to-head at Berlin’s Olympiastadion to determine this year’s DFB Cup winner. BREAKING NEWS: Bayer 04 Leverkusen have signed Swiss striker Josip Drmic from 1. FC Nürnberg on a five-year deal. If you thought Saturday was dramatic, just wait for Sunday's Bundesliga 2 action. SC Paderborn could celebrate an historic promotion, but they still have work to do, while SG Dynamo Dresden and DSC Arminia Bielefeld face up for a relegation play-off decider. Once again, check out who will be broadcasting the games live in your country, or follow the action on our Twitter account as we keep you up to date with all of the drama as it unfolds. Furthermore, our live ticker will bring you all the goals as and when they go in so you won't miss any of the action. We will be back after the final whistles are sounded and the verdicts have been delivered with all the reaction. Join us then! Good morning and welcome to the continuation of our live updates on what is set to be a day of twists, turns and unparalleled emotion up and down the country. There is plenty still at stake and if you want to know how you can follow all the drama as it unfolds, check out who will be broadcasting the games live in your country. That's all for today, but make sure you join us on Saturday for what is certain to be an enthralling finale to the 2013/14 Bundesliga campaign. Bis morgen! would like to take one moment and wish one of German football’s greats a very happy birthday.